Shakes and Fidget is a fun fantasy RPG satire and an award-winning role-playing game at the same time! Sounds crazy? Over 50 million players make it one of the most popular online games in the world! 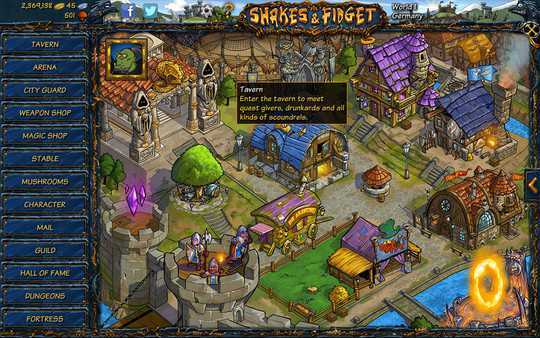 Shakes and Fidget is a fantasy RPG satire that brings in front a very simple, yet easy to understand gameplay. The game is designed with the idea of creating your own hero and help him reach the hall of fame. There are few games like Shakes and Fidget out there, and that makes it extremely interesting and distinct. At its core, Shakes and Fidget is basically offering a really interesting satire-based approach towards being a hero. You can explore all buildings of the city as well as many different dungeons, eliminate enemies and you can easily complete quests and improve your characters the way you want to. Of course, while you can be AFK and complete quests, you can also play and enjoy the experience in any way that you want. While the game does have its fair share of features, it doesn’t really hold your hand. And while yes, you can be AFK, you do need to be in-game in order to take some new quests and advance. So yes, Shakes and Fidget is time dependent, and that’s why the progress in the game will depend based on the time spent in-game. On top of that, the game is play to win and NOT pay to win. The progress is depending on the XP and level. If you pay you can get a larger energy bar, and that does offer a bit more benefits for the paid players. But even if you don’t pay, the game is very fun in short bursts. I particularly found the community to be very helpful. 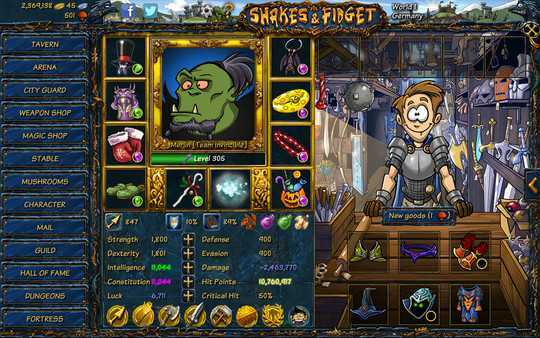 In the case of games like these, you can rarely find some fun gaming moments, and Shakes and Fidget does a very good job in this regard. It does make it easier for you to embrace the overall experience and the results do end up getting better. The satire aspect is maybe what makes people come back to it. Sure, you do need a ton of time to get the progress you want, the tutorials are not that comprehensive and so on. But the entire experience is focused on having fun, and that’s the real benefit. You get to have fun and enjoy the game in that way you always wanted. It’s really something special, and unlike anything you have ever seen out there. The RPG aspect is good here as well. There are multiple classes and each one has different mechanics. While there’s not the best balance out there, the classes are fun and functional, which is exactly the type of thing you would expect. 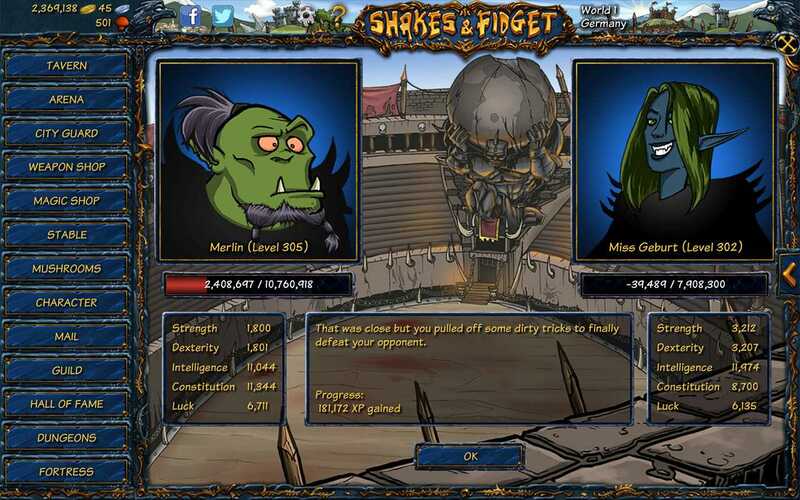 As a whole, I found Shakes and Fidget to be a fun game. Its unique approach makes it great for casual play, but if you want to progress a lot you have to spend a lot of time but you are also free to spend some money to speed up some things to enjoy the game even more. 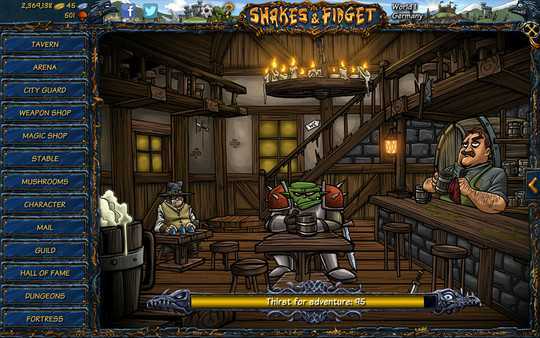 Yet despite all of that, Shakes and Fidget is very interesting and it does offer a ton of nice ideas. If you’re one of those players that want unique, action packed mechanics, you won’t find all of them here. But Shakes and Fidget is very special and funny, and the satire aspect just makes it stand out!